Manual scavenging is the practice of employing humans to empty toilets, sewers and manholes, and despite being banned by the Indian government in 1993, it is still prevalent across the country. A Kerala-based startup named Genrobotics Innovations aims to end the deplorable practice which puts workers at risk, exposing them to hazardous chemical and biotoxins. 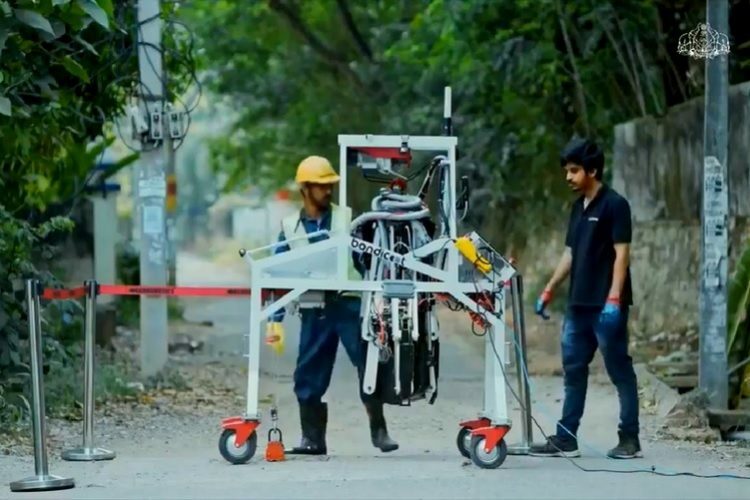 Genrobotics’ ‘Bandicoot’ robot can efficiently clean manholes and sewers, ending the need for a person to descend in the manhole and do the dirty job. Kerala chief minister, Pinarayi Vijayan, recently shared a video which depicts the journey and motive behind the creation of Bandicoot, and how it evolved from a passion project of a few engineering students into something socially productive. The team began work in college after being inspired by the Iron Man suit in the Marvel movies, and was later commissioned by Kerala IT Secretary, M Sivasankaran to develop a robot that can clean manholes. With the necessary resources and workspace provided by Thiruvananthapuram’s TechnoPark, they set about creating a prototype based on the Tony Stark alter ego. Facing financial constraints, the team dismantled their original Iron Man suit to salvage its parts and develop their prototype manhole-cleaning robot, which was later awarded the winner at the Startup Innovator competition organized by the Kerala Water Authority. The Bandicoot has 4 arms and a bucket system attached to a spiderweb-like extension which goes inside the manhole to lift out the sewage, and can be operated with relative ease by a single person, without touching the hazardous material. Billed as the world’s first manhole cleaning robot, Bandicoot will be used by the government to eliminate the practice of manhole scavenging in its entirety from the state. Genrobotics has already trained two manhole cleaners on how to use the Bandicoot, ensuring that their livelihood is secure, but their health is not put at risk. The startup has been incubated under KSUM, the state’s nodal agency for entrepreneurship development, and has received financial backing from the Kerala Financial Corporation (KFC) and Unicorn India Ventures. Genrobotics Innovations aims to develop multiple versions of the robot and has already received offers from the Karnataka and Tamil Nadu government to bring the technology to the states. The Genrobotics team aims to ramp up the production of Bandicoot and disperse its benefits in more regions so that the inhumane practice can be brought to an end.